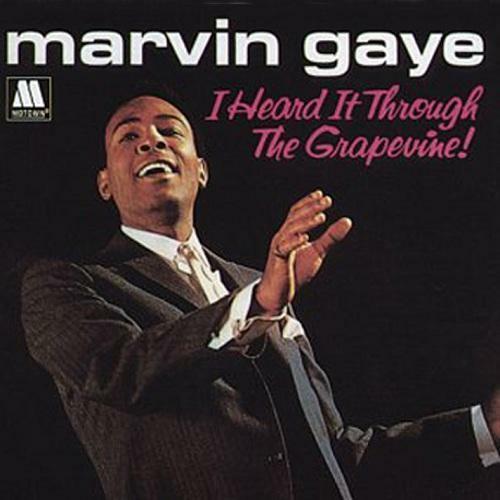 Marvin Gaye’s version of I Heard it Through the Grapevine is one of Motown’s highest achievements: a fantastic song by Norman Whitfield and Barrett Strong (writer and original performer of Money (That’s What I Want), produced brilliantly by Whitfield and featuring an inspired arrangement by Paul Riser, a career-highlight vocal from Gaye and top-notch performances from every musician and technician involved in it. As was often the case when his staff produced something technically innovative or emotionally raw, label boss Berry Gordy was suspicious of the record and blocked its release as a single. Whitfield went on to produce another version with Gladys Knight. Despite a busy bassline by James Jamerson, Knight’s version is approximately one-tenth the record that Gaye’s is: a rather lame attempt to muscle in on Aretha Franklin’s turf. Gordy didn’t much care for Knight’s cut, either. What Gaye’s version had and Knight’s lacked was genuine edge, the desperation that’s evident in Gaye’s record from the first note of its ominous intro: a single snare hit like the slamming of a door, quickly followed on the other side of the stereo field by that classic intro riff, supported by a simple kick-and-hi-hat groove, over which a tambourine hisses like a rattlesnake. The right hand of the piano and a harmonised guitar enter (again on opposing sides of the stereo field), the brass swoops in, and Marvin starts singing. It’s a bravura moment, and the record’s barely begun. Whitfield’s genius extended right down to the way the drum track was arranged. Playable by one person, the drum part for Gaye’s take on Grapevine was – at least according to this article – performed by two drummers, with a third adding bongos. The three guys in question were Uriel Jones, Richard “Pistol” Allen and Benny Benjamin. I don’t know for sure who played what, but most of the sources I’ve seen suggest Allen and Jones both played “drums” (meaning a drum kit) and Benjamin “percussion”, implying that he was on bongos (the tambourine was almost certainly Jack Ashford). One of the two drummers played kick and hi-hat, with occasional full-kit fills, while the other simply hit two and four on what sounds like either a particularly slack-tuned tom-tom or a similarly low-tuned snare with the wires off. It’s a fundamental part of the grammar of pop music that the backbeat is provided by a snare drum. Any time a drummer chooses to substitute a snare drum for a tom, the alert listener will feel that something is up. It creates a tension. Is the drummer eventually going to break out of this pattern and switch to the more open-sounding snare drum, releasing the tension, or will the drummer simply keep going and ratchet it up even further? At 1.57, for four bars, the drummer playing full kit finally brings in the snare, while the other drummer reinforces the beat with his tom. But just as soon as the tension is released in this way, the final verse begins and the original groove is restored. And that’s how it stays, with Gaye unable to break free of the trap he’s caught in. It’s a demonstration of how a great drum track can narrate a song, just as surely as any singer. This entry was posted in Music and tagged 1960s, Aretha Franklin, arrangement, Benny Benjamin, Berry Gordy, drummers, drummers who can drum/singers who can sing, Drums, Gladys Knight, grammar of pop music, I Heard it Through the Grapevine, Jack Ashford, James Jamerson, Marvin Gaye, Money (That's What I Want), Motown, Norman Whitfield, Paul Riser, production, record production, recording, recording drums, Richard "Pistol" Allen, sound recording, Sound recording and reproduction, tambourine, underrated drum tracks, underrated drummers, Uriel Jones on October 31, 2015 by rossjpalmer.